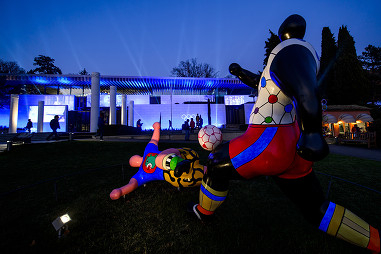 The Olympic Museum in Lausanne has reopened after a five-year renovation, just in time for the 2014 Sochi Winter Games. In a dazzling display of technological prowess, it celebrates the glory of the Games and deflects the controversies they spark. Although it calls itself a museum, the stunning building on the shores of Lake Geneva has been revamped into what could best be described as a temple in honour of the Olympics modelled by a digital Disneyland. Built in 1992, the museum originally contained a chronological tribute to the history of the Olympic games.Closed for the last two years for the CHF 55 million ($61 million) renovation, its present reincarnation is in the form of a time capsule, complete with all the electronic gear and technological effects of the 21st century. In one part, 3D images allow visitors to experience the original games at Olympia in Ancient Greece. Elsewhere, the ideas that shaped the modern Olympic games escape in the shape of a mental kaleidoscope from the mind of founder Baron Pierre de Coubertin. The imagery is overwhelming, sometimes it is even a little kitsch – as when rain trickles down the window in de Coubertin’s study. The aim is to tap into emotion. In a hemicycle at the heart of the building, a gigantic mosaic of screens delivers the build-up of the athletes as they are about to spring into action. “With this total immersion technique, we are inside the head of the athletes: we are inviting visitors to experience their emotions,” explained curator Frédérique Jamolli, as the words “desire”, “determination”, “This is my time” flash across the screen and the music revs up like the engine of a Porsche. Museum director Francis Gabet told swissinfo.ch that this was an editorial choice: “People come here for the emotion.” Asked if he was not afraid that technology would take centre stage, he answered that the images are powerful enough to speak for themselves. “We want people to feel the earth, the grass, the excitement,” he said. The visit starts at the top of the building and descends the three floors in a spiral. “We planned it like a film, with a storyboard and different scenarios for each topic,” the director said. There is a main theme per floor. The first, dedicated to the “Olympic World” (its history), is where the Olympic movement clearly positions itself as one of the best things that ever happened to humanity. We are introduced to the great men who contributed to the organisation of both the ancient and modern games, bask in nostalgia at the sight of the torches of every edition since 1936 and are told how the brutal contexts of each game were dealt with efficiency and elegance. This is also the section meant to highlight the creativity of the architects, designers, urban planners and artists who helped shape the games. We are not however reminded of the many white elephants left behind, when the host cities were unable to maintain the glamorous infrastructures they had built in haste. Nor is there mention of the long-term financial consequences that countries can be left with. The second floor is a voyage through the “Olympic Games” and the only celebration of the great athletes without whom the Games would not exist. Their equipment tells the story and films deliver their moments of glory.“This is where the competition can be experienced for real,” said the curator. The third section is labelled the “Olympic Spirit”: it reviews the ingredients that are necessary to make a champion, but skirts on the ethical issues that they face.“What we would like to explain is that the Olympic movement is not only the Olympic games, it’s also a lens to observe society,” said Frédérique Jamolli. We are introduced to the backstage of the Olympics, where athletes receive their physiological, psychological and nutritional preparations. The brands of Findus and Tescos are on display, alongside the innovative materials that are helping boost performance, like the alloys that have replaced bamboo for the high jump, or high-tech shoes. What about those illegal ingredients that enhance performance, swissinfo.ch asked. The subject is no longer taboo, answered both the curator and the director, it is a reoccurring problem that the museum has not sought to ignore. “When we speak about doping, it is not to denounce an athlete, but to explain the work of WADA, the World Anti-Doping Agency, how we can find alternatives, and how we can fight doping,” answered Jamolli. A small display exhibits the various chemical solutions. “We are winning the war, but not the battles,” Francis Gabet observed. In a tidy orchestration of events, the day the museum was inaugurated was also the day the outgoing president of 12 years, Jacques Rogge, handed the Olympic key to his successor, Thomas Bach, his vice-president of ten years. German-born Bach, an Olympic fencing gold medallist and lawyer by trade, was recently elected president of the International Olympic Committee amidst allegations that his ties to the corporate and Arab worlds are too close to guarantee his independence. There is no sign, yet, at the Lausanne showcase of some of the immediate issues that the Olympic president will now face, amongst which: Russia’s recent anti-gay laws, the social unrest in Brazil generated by the combined expense of the 2016 Summer Olympics and the 2014 World Cup, the collusion of Olympic judges, the numerous deaths on construction sites racing the clock and the growing presence of social media, which has already led to the ban of two athletes for unsavoury Tweets. Lausanne, on the shores of Lake Geneva, has been the home of the Olympic Committee since 1915, when the founder of the modern Olympic games, Frenchman Pierre de Coubertin, transferred there from Paris. The colours of the five rings of the Olympic are those of the flags of the original member countries in 1914. There are presently 204 national Olympic committees, more than in the United Nations. The Olympic Museum was originally designed by the Mexican architect Pedro Ramírez Vázquez, an International Olympic Committee member, and by Swiss architect, Jean-Pierre Cahen. The museum opened in 1993 and was named European Museum of the Year in 1995. It reopened its doors to the public on 21 December 2013, following a 23-month renovation designed by the innovative Swiss architectural practice Brauen & Wälchli. The exhibition space has almost doubled in size, including a temporary exhibition space for two shows a year. The permanent exhibition space contains 300 screens and more than 1,500 iconic items. The revamped Olympic Museum has been baptised “TOM” an acronym for “THE Olympic Museum”. There are more than 60 other Olympic museums in the world. The Olympic campus includes an Olympic Studies Centre and conference facilities, as well a learning zone for children.